The West Point Band has been covering a lot of ground this November. In addition to ceremonies and parades, there were performances for Veterans luncheons, a Marine Ball, banquets, and a second consecutive week where the Jazz Knights Combo performed at the United Nations. There were funerals, cadet formations, and the clockwork sounds of Reveille and Retreat by the Hellcats. Add rehearsals, sectionals with the cadet band, secondary duties and other performances, and everyone was busy with a number of different tasks. The band’s Veterans program, “Standing for Freedom – A Salute to Veterans,” was one of the month’s highlights. It began with the equipment and technical set-up, rehearsals, interviews, protocol labeling seats, and organizing parking and staging. It was a tremendous effort from all involved and is a labor of love and respect for all our Veterans, past and present. “Standing for Freedom” is a great example of the team effort necessary to put together an event of this scale. From performers to ushers, to those who set up and moved equipment, to narration, video and audio – everyone worked together. Meanwhile, as the Band was performing the concert, Master Sergeant MaryKay Messenger was singing the National Anthem at Madison Square Garden for the New York Knicks game. On Monday (Veterans Day), the band started early with a Hellcat Bugler performing taps on the floor of the New York Stock Exchange as the Superintendent, Lieutenant General Caslen, along with nearly twenty USMA graduates who are now leading NYSE companies, rang the opening bell. The Hellcats were featured on “Fox and Friends” and shared with America the professionalism of its military. A little later, the Academy Brass Quintet was featured on “Fox 5” during and prior to the coverage of the Veterans Day parade. The rest of the band was at the Eternal Flame wreath-laying ceremony at Madison Square Park where a “who’s- who” of New York politicians and renowned guests of honor were on the Dias. The West Point Band performed pre-music for the ceremony along with a fine version of the Armed Services Medley and a solo bugler played a flawless performance of taps. The morning was brisk and it looked like the parade might be a bit cold, but the sun came out just as we started moving up 5th Ave. The scene of hundreds of thousands of New Yorkers and visitors lining the street, along with the regular hustle and bustle of NYC, was inspirational. The highlight was the band stepping on the Red Carpet in front of the reviewing stand and playing the Army song, The Army Goes Rolling Along. Meanwhile, our remaining Band members were supporting other events like the Highland Falls Fire Department’s Veterans Day activities, a Veterans dedication for Habitat for Humanity, and of course, reveille and retreat here at West Point. We’re looking forward to a busy time through December: halftime at the Giants game last Sunday, Concert Band and Jazz Knights concerts this past weekend, the West Point Holiday Show, Army/Navy football game, FOX Holiday Special, and other holiday performances for the Corps, West Point, and New York City and surrounding communities. And up at the flagpole above Trophy Point, the sounds of reveille and retreat continue like clockwork. The West Point Band, the Army’s Oldest, sharing the story of West Point and the Army with America. We consider ourselves fortunate to make music and work together not only in the same ensemble, but the same section. Each person in the band has a different story to tell. This is how we met and successfully auditioned for the West Point Band, a group we are thrilled to be a part of and a place we are happy to come to work. We have made a great team musically, personally, and professionally since the day we met at the Eastern Music Festival in North Carolina. We grew together through our undergraduate at Florida State and graduate studies at Southern Methodist University, studying with the same teachers and playing in the same ensembles. We fondly look back on those times and are thankful to share the same educational and professional experiences. Some of those include summers with the National Repertory Orchestra and subbing with the Dallas Symphony Orchestra. Nicole was also a fellow at Tanglewood and performed with the New World Symphony Orchestra prior to her audition with the West Point Band. Nick always knew about the premiere military bands because his father was a horn player in the United States Army Band, “Pershing’s Own”, in Washington D.C. for 32 years. Deep down he always wanted to go into the family business and winning a position with an organization like the West Point Band was a realistic long-term goal he realized in October 2005. Nick completed graduate studies and reported to West Point in August of 2006. Nicole moved to New York after finishing her degree and we married in 2008. She freelanced and took orchestra and military band auditions before winning a position with the Concert Band in May of 2009. When Nick learned she was interested in auditioning, he recused himself from the entire process, leaving the outcome of the audition to Nicole’s prowess as a musician and the skilled ears of his colleagues on the audition panel. Having intensively studied with the same teachers at the same schools, we know each other’s tendencies, strengths, and weaknesses, which helps us, our section, and the unit be more efficient. This is critical when our operational tempo as an ensemble and as a unit is so fast-paced. We model our approach to playing and working together after our teacher and mentor, Greg Hustis, who is the epitome of the consummate professional. He was and still is a great role model on and off the stage. This is something we strive to emulate every day, which has worked very well since we started dating ten years ago! As it has been throughout our relationship, we enjoy regular opportunities to practice at home and rehearse excerpts and duets. We often give each other honest and constructive feedback and enjoy being able to share similar work experiences. The band schedule is both predictable and unpredictable. While this can be challenging for anybody, this is compounded by the fact that we are new parents. We rely on wonderful childcare providers in New Windsor during the normal duty day. As professionals who offer musical and ceremonial support outside of the regular days and hours of the work-week, we often rely on teaming up with Staff Sergeants Joe and Mikki Skinner for those occasions since our daughters attend the same daycare and get along so well. 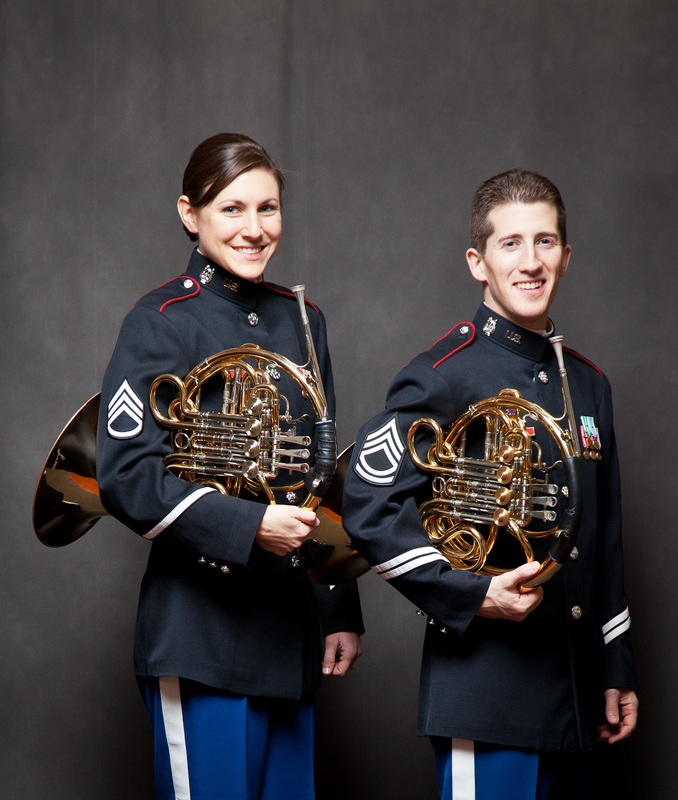 We also share the unique challenges of being a dual military couple in the West Point Band. For more intensive occasions, such as the annual Army-Navy trip, we heavily lean on family. Since all our family live on the east coast, finding grandparents or aunts and uncles to watch our daughter is never a problem. We are thankful for the help and support of our friends and family. We love spending our free time with them, traveling, and exercising. We had personal bests at another Army Ten-Miler this fall as part of the West Point Band Team. We strongly feel keeping up with physical fitness and a clean diet are instrumental to our performances as musicians and our overall well-being. We consider it a privilege to be members of the West Point Band, a fantastic organization that is the sum of its parts. We love the opportunities to grow as we feed off energies from each other and the collective creative collaboration of our friends and colleagues. This inspires us to stay honest with our musicianship and keeps us current in an art form and a world that is always changing. The Academy and the Army often place new demands on us as musicians and professionals and we approach everything with an open mind and a can-do attitude. 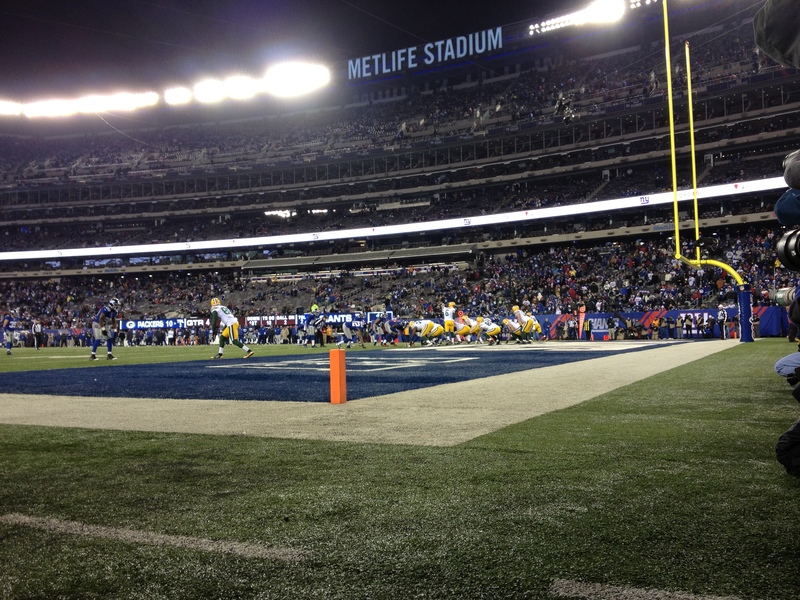 On November 25th, we played the halftime show at the Giants Packers game at Met Life Stadium in NJ. It was a great experience. Not everyone is a football fan, and certainly not everyone is a Giants or Packers fan; but without question, every member of the band feels something special when performing for 82,566 people at the same time. We began our task weeks ago, when we pre-recorded the music that would be performed at the game. Wait, why pre-record music if you’re going to show up and play it anyway? The main reason is the weather. You have no idea what the weather in the Northeast is going to be like in late November. it could be 60 degrees, or it could be in the 20s, or raining, or snowing. Wind and brass instruments react badly to bad weather. If it’s raining, water gets in the toneholes of all of the woodwind instruments, making them unusable. If it is cold, all of the instruments go flat, but not at the same rate, making playing in tune nearly impossible. If it is really cold, as in well below freezing, the valves on brass instruments literally freeze in place, making it impossible for the musicians to change notes. No matter what the weather, the job must get done. For a performance as critical as this, pre-recording the music was the safest call. We had a sound check on the field at about 4:00 in the afternoon, nearly 4.5 hours before kickoff. I was hoping to see some early warm ups going on, but there was nobody around, save the audio and visual team from the stadium. It is always awe-inspiring to walk right to the center of such a large stadium, and this day was no different. Sound check complete, we retired for our meal and long wait before halftime. The stadium, totally empty during our sound check. We were fed well, in a very cold tent outside the stadium. After a meal of pasta and meatballs, very North Jersey, we were ushered inside to the performer’s holding room, where we waited out the next few hours watching other football games on the TV, or just catching up on some reading or other work. Halftime came rather quickly once the game started. Most of us are used to the pace of Army football games, not the fast action of an NFL game. We waited patiently in the tunnel for the second quarter to end, listening to the cheers and jeers of the crowd above us. Once halftime started, we stepped onto the field as the players were departing. Immediately, we were cheered by the hundreds of fans who were close enough to notice an entire military unit walking down the sideline. We received salutes and thanks from many civilians watching the game. For the show, we performed the Armed Forces Medley, a compilation of the service songs from each branch. The crowd was asked to stand and be recognized if they had served in the Coast Guard, Air Force, Navy, Marines, or Army. This is a wonderful thing to do for veterans, but not all that effective in a stadium at halftime when most people are headed for the bathroom or to find a hotdog. After the medley, we played God Bless America, which was much more moving. We were able to see and hear thousands of fans singing along with us as we played, hats and hands over their hearts. Even the team personnel left on the sidelines stopped what they were doing and sang along. Throughout the show, we all took great delight in not only performing for the fans, but seeing both ourselves, and the fans reactions to the show on the immense jumbo-trons that ring the stadium. After the halftime show, most band members changed and went back home. I stayed behind with a handful of other band members to watch the rest of the game. We were not given tickets for the game, which originally seemed to be a bad thing for us. It turned out to be a great thing. We were allowed to watch the game from the sidelines, not an experience that can be duplicated anywhere. We stood in the corner of the end zone, mere feet from the sideline and hoped the action would make its way to our end of the field. Even though the Packers couldn’t seem to put anything together that night, they did finally make it down to our end of the field, and we were close enough to hear the player’s voices clearly, and hear the hits as they happened. Overall, the game was a great experience, one we hope to repeat soon.